Garan Marethi, a Dunmer mage, is a vampire found in Volkihar Keep. He's a high-ranking member of Harkon's court and used to be a member of House Dres. He wears light gray vampire armor with vampire boots. He is equipped with a leveled one-handed weapon which can be up to Elven quality. He carries random leveled bandit loot, plus a 25% chance of an additional 1-9 gold. He knows three leveled elemental bandit Destruction spells, one fire spell (Flames, Firebolt, or Fireball), one frost spell (Frostbite, Ice Spike, or Ice Storm), and one shock spell (Sparks, Lightning Bolt, or Chain Lightning). On a regular day, he wakes up at 4pm, and spends the rest of the night wandering around the castle. Finally, at 8am, he then heads to his coffin to rest. 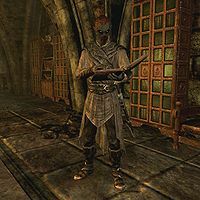 Like most of the court and provided that you sided with the Dawnguard, he will be killed in the assault on Castle Volkihar. The Bloodstone Chalice: Fill the Bloodstone Chalice from the Bloodspring at Redwater Den. Culling the Beast: Kill the thin-blooded vampires. The Hunt: Kill the Dawnguard spy. Protecting the Bloodline: Destroy a vampire before it turns its allies. "I need to fetch the Bloodstone Chalice." Orthjolf: "Well, then... Best of luck to you." He'll then keep walking and say, "Vingalmo and Orthjolf are Harkon's primary advisors. I'm sure they're quite surprised to learn that you're taking the Chalice." Once you reach the chalice room, he'll say, "And here we are. Now, this Chalice needs to be filled directly from the bloodspring that is the source of Redwater Den. But that's not enough. Once that's done, the blood of a powerful vampire needs to be added to it. Keep in mind that Redwater Den has fallen into... well, let's just say less reputable members of society now dwell there. It's your choice whether to attempt to deal with them or force your way through. Hurry back. You don't want to keep Lord Harkon waiting." Before you go, you can now ask what the bloodspring is, and he'll explain, "An ancient font, full of power. As much as it looks like blood, sadly it is not. Can you imagine if it were? We'd never need to hunt again. Still, its liquid is powerful, full of magic. Others have noticed, though they have never fully realized its potential." "Lord Harkon will be pleased." When you return with the chalice, he'll greet you with, "I see you have returned. Lord Harkon will be pleased. You met Stalf and Salonia, I assume? Lord Harkon and I suspected they might follow you there." If you tell him they tried to kill you, he'll say, "Well of course they did." If you tell him you killed them both, he'll say, "As well you should have." Either way, he'll then say, "Welcome to the politics of Lord Harkon's court. Vingalmo and Orthjolf both long for our Lord's throne, but cannot make overt moves against him. Each sought to gain power by using his underling to kill you and keep the Chalice for himself. By ensuring the Chalice reaches our Lord, you have increased his power over them, and at the same time deprived them of their little pets. You've done Lord Harkon two great services. Take what you've learned to heart, and be careful who you trust. Now, I believe that Lord Harkon wishes to speak with you." Garan: "My lady, you have my deepest sympathies. I am sure this was not easy for you." Serana: "He was out of control, Garan. It had to be done. I'm not happy about this. He... he was still my father. But I suppose my father really died a long time ago. This was just the end of something else." Garan: "Of course, my dear. All will be well now." He'll then turn to you and say, "My congratulations on defeating Harkon. Clearly, you are the superior vampire. You are the new Master; we bow to your power. A power which, I note, includes Auriel's Bow. The castle, of course, is yours. We shall follow you, and help spread your influence across Skyrim." Afterwards, if you ask him if something's on his mind, he'll say, "Now that the Castle is yours, I was wondering. Would you be interested in having the passage to the Courtyard restored? Harkon clearly never cared much for it." If you dismiss him, he'll say, "My apologies. I shall not trouble you with it again." If you tell him to see to it at once, he'll say, "It would be my pleasure." If you leave the decision to him, he'll say, "Then I think I shall see to the repairs. Thank you for your time." If you chose one of the latter two options the gate to the courtyard will be repaired. When conversed with during Bloodline "Present yourself to Lord Harkon at once." Responding to Harkon during Prophet "It will be done my Lord." When you ask him what you can do to help, he may say, "A cadre of lesser beasts has become a nuisance, taking too bold an approach to their feeding. The herd is becoming distressed, which makes it more difficult for us to slip in and out undetected. It is time to cull the weak." When you come back after the deed is done, he'll say, "You have done well. It may seem cruel that we hold our thin-blooded kin in low esteem. But our needs must come before theirs." 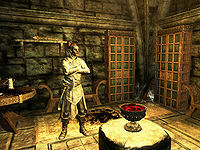 When you ask him what you can do to help, he may say, "I've learned the whereabouts of a troublesome Dawnguard member. You will track him down and dispose of him. But please, do be discreet. Our aim isn't to stir the nest, just to skin a rat, reminding them that they are the prey." When you ask him what he means by discreet, he'll say, "I hope you comprehend killing better than you comprehend speech. Don't. Get. Caught." When you confirm that you understand, he'll say, "Good." If you return to him after you killed the spy in a non-discreet manner, he'll say, "While that's one less trouble maker to keep an eye on, you could have been more discreet in your approach to the problem. I had thought better of you." If you return after you completed the job discreetly, he'll be pleased and say, "Excellent. I knew I could count on you. That's one less trouble maker to keep an eye on." When you ask him what you can do to help, he may say, "One of the feral brood has joined a group of bandits, presumably with aims to grant the gift to the entire lot of them." or "One of the feral brood has joined a group of nercromancers, presumably with aims to grant the gift to the entire lot of them." Either way, he'll continue with, "Needless to say, we can't abide that, as it would raise general alarm amongst the herd, to say nothing of the increased feeding competition. You are to destroy the feral creature before this small problem becomes a larger one." When you come back successful, he'll say, "Good. I prefer to nip budding problems before they reach full bloom. I trust it wasn't too much of an effort on your part." When Harkon is dead and you ask him what you can do to help, he may say, "The Dawnguard will, no doubt, soon become even more of a nuisance now that Auriel's Bow has been recovered. We need to strike a crippling blow against them before they muster more men against us." 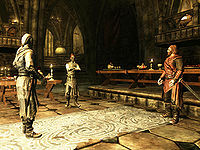 If you ask who the Dawnguard is, he'll explain with, "They're a splinter group of the 'Vigilants of Stendarr.' A bit more ambitious, it seems. The Dawnguard are apparently focused on exterminating vampires, noble and brute alike. Not a serious threat, but we can't leave them completely unchecked or they may become one." When you confirm your understanding, he'll say, "Good. They've holed up in an abandoned fort in the Reach [sic]. Killing their leaders should discourage them from an out and out war with us." When you come back successful, he'll say, "Excellent. That should prevent the problem from escalating. Though they are a rebellious and determined lot. While you've severed the snake's head, the body will likely writhe a while longer." Taunting an enemy "Come now, you think you stand a chance against me?" "After 400 years, you think you'll be the one to take me down?" "I can't decide which parts of you I'd like to keep for a while..."
Attacking "I can smell your blood!" "I am above the petty squabbles here. I have lived far to long to be bothered by them." "I saw more than enough political maneuvering in my time at House Dres. I was tired of it then, and I'm tired of it now." "I'll never understand the Nord fascination of weapons. Magic is so much more versatile, don't you think?" If you accidentally end dialogue while Garan is asking if you want to restore the door to the courtyard, you will not be able to ask again, and it will be impossible for it to be restored via dialogue. This can be circumvented with the console command setstage DLC1VCController 40, which forces the repairs to appear when the interior cell reloads. It may be faster to let the courtyard repair first, transporting there with coc DLC1VCCourtyardOrigin, and to wait in real-time until the rubble phases out and the repairs phase in onscreen. The interior will be complete by this point. This also works for Dawnguard-aligned players. To further the consequences of repairs if Valerica is broken, (set DLC1VQ05PostMove to 2 will return Valerica if she is stuck in the Soul Cairn after returning to her and informing her of Harkon's death) sqv or showquestvars used on the same quest DLC1VCController will display variables under the dlc1vampirecastlecontrollerscript section to select with prid, to enable and disable phased object sets manually. prid xx013EF2 disable followed by prid xx011E37 enable will restore her garden if it does not appear on its own despite her functioning dialogue. The same method can be used to alter the castle interior, such as restoring Serana's room. This page was last modified on 3 January 2019, at 04:21.